Enhance the overall radiance of your hair and skin with The Ordinary 100% Cold-Pressed Virgin Marula Oil, an antioxidant-rich treatment that restores moisture. To better defend your skin from pre-mature ageing and photo damage, The Ordinary 100% Cold-Pressed Virgin Marula Oil delivers antioxidants, vitamins and omegas into weakened areas of your skin and hair. Infused with the restorative powers of oleic acid and linoleic acid, this glow-boosting formula enhances cellular activity, creating a revived and rejuvenated complexion and a silky, soft appearance to your hair. For hair, massage a few drops into damp, clean hair then dry. For skin, massage a few drops into your skin at night. Free from water, alcohol, silicone, nuts, cruelty, fragrance, parabens, sulphates, mineral oil, methylchloroisothiazolinone, methylisothiazolinone, animal oils, benzalkonium chloride, coal tar dyes, formaldehyde, mercury, oxybenzon. Vegan. 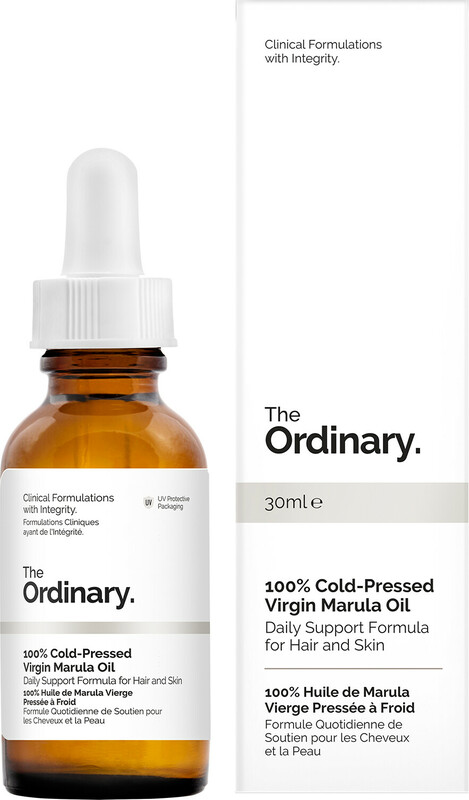 The Ordinary 100% Cold-Pressed Virgin Marula Oil 30ml is rated 5.0 out of 5 by 1.